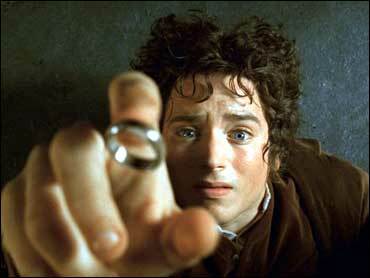 'Lord Of The Rings' Opens In U.S. Most filmmakers only have to contend with professional critics. Peter Jackson, director of "The Lord of the Rings" trilogy, will face millions of long-time readers ready to second-guess his every move in his adaptation of J.R.R. Tolkien's fantasy classic. The criticism, carping and kvetching could make the few sour grapes voiced about "Harry Potter" seem like child's play. Or, Jackson could be hailed as a new hero of "Middle-earth" for "The Fellowship of the Ring," the first installment in his hotly anticipated cinematic trilogy based on Tolkien's novel. "The Fellowship of the Ring," which is already in theaters in London, opened in North America on Wednesday. The initial reaction was extremely positive. From hard-core fans to some who couldn't read past the first pages of the books, people flocked to theaters like hobbits on a pilgrimage to Middle-earth to see the much-anticipated debut. "Amazing - just amazing," said Edward Chu, 26, leaving a late-night showing in Toronto. "I am definitely going to have to see that again. A couple of times." He and thousands of others were expected to turn the fantasy flick into an instant box-office blockbuster. Advance ticket sellers reported that the movie was responsible for roughly 85 percent of their sales this week. "It will certainly be one of the biggest advance ticket sales of the season, probably second to Harry Potter," said Russ Leatherman, the founder and voice of Moviefone, the telephone service that by Tuesday had sold more than 100,000 advance tickets to "Rings." Just how anticipated was this movie? Hordes of devoted followers have watched each stage of the film's production via Web sites in scores of different languages over the past two years. "I've spent the last seven years of my life on this project so far, pouring my heart into every single aspect of it," Jackson said "But I think that's the least we owe to Tolkien and the legions of fans around the globe." The criticism leveled at "Harry Potter," which has pulled in over $240 million since its release on Nov. 16, was that director Chris Columbus stuck too close to the book by author J.K. Rowling. But Tolkien fans have an opposite concern -- that Jackson will have strayed too far from the "bible." "I've tried to capture the feeling of Tolkien for those who have read the book," said Jackson, an avowed Tolkien fan. "I didn't want to be a totally slavish Tolkien interpreter," either, he said in a series of interviews to journalists. "It has been equally important to us that the films amaze, surprise and delight people who have never read the books." Movie studio New Line Cinema, which along with "Harry Potter" producer Warner Bros. is owned by AOL-Time Warner, is hoping that Jackson's high-wire act translates into the kind of real box office sorcery that "Harry Potter" has conjured. "The Lord of the Rings" has received raves in early reviews from British critics. "Forget Harry Potterthis has the true ring of greatness," the Daily Mail newspaper's film critic, Christopher Tookey, declared. "Critics who gave five-star ratings to Chris Columbus' competent but uninspired Harry Potter movie are going to have to find 10 if they are to do justice to 'Fellowship of the Ring,'" he said. In the U.S., rave reviews werer also the order of the day. Associated Press movie writer David Germain had this to say about the film: "Dense with detailed lore Tolkien-ites crave yet packed with action and luminous visual effects for the Tolkien uninitiated, this is one of the finest fantasy films ever made." Jackson and his team of more than 2,400 actors, designers and special effects people spent two years, and nearly $300 million, making all three films at once in New Zealand. It has been billed as the first time a director has made a film and two sequels at the same time. The sequels are to be released one at a time at Christmas 2002 and in 2003. The success of the venture may well depend on how fans receive "The Fellowship." Elijah Wood, who plays Frodo Baggins, the hobbit tasked with destroying the dark lord Sauron's ring of power and saving Middle-earth, said fans would forgive the little plot tweaks and omissions required to make a three-hour film out of a 1,077 page book. "Most of them will understand why," he said. Since its publication over 50 years ago, Tolkien's story of wizards, hobbits, elves, dwarfs and men caught up in a struggle with evil for the future of Middle-earth has sold more than 100 million copies. The epic has so enchanted many of its readers, the most fanatic of whom call themselves "true believers," that if a portal were to open between this world and Middle-earth, it appears they would blithely step through it. "The impulse is being called reactionary now, but lovers of Middle-Earth want to go there. I would, like a shot," wrote "The Last Unicorn" author Peter S. Beagle in his 1973 foreword to "The Lord of the Rings." With that level of devotion to Tolkien's work, Jackson and his cast knew what they were up against in trying to bring the epic to the screen. Tolkien fans have been disappointed before. Sequels to the 1978 animated version by Ralph Bakshi were abandoned after a lukewarm reception. Veteran British actor Ian McKellen, who plays the magisterial wizard Gandalf, said the aim this time was to make a film that convinces audiences Middle-earth was real. "This is neither history nor fiction," he said. "You just believe it." But will the audience be "true believers?" To ensure that they are, Jackson hired respected Tolkien illustrators Alan Lee and John Howe to design the films. He also brought in language coaches to teach the actors to speak Elvish and hired Tolkien scholars as advisors. Combine all that with New Zealand's stupendous scenery -- the film at times is like a picture postcard of the island nation -- and audiences should get the feeling that they are smeplace otherworldly. Jackson's prior film credits include the thriller "Heavenly Creatures" and the gory splatter film "Dead/Alive" (aka "Braindead"). His expertise in horror flicks came through strongly in the lavish battle scenes, which are worthy of films like "Braveheart" or "Gladiator," though they are a bit too violent for young children. The scene where Boromir (Sean Bean) and Aragorn (Viggo Mortensen) battle the orc and goblin forces of the turncoat wizard Saruman (Christopher Lee) is especially gory. But the bottom line is that Jackson has stayed true to Tolkien's major themes -- courage, the power of friendship and the forces of nature overcoming those of industry -- while keeping a sense of fun. "I just made the kind of film I would have wanted to see as a 10-year-old," Jackson said. "What I hope is that people will see the film and experience what I felt."